Well, could change have become more real, or more relevant, this past decade? 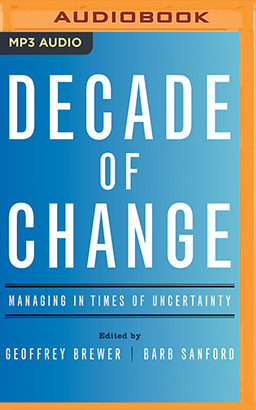 Decade of Change features insights and wisdom into how to manage, and make the most of, change. Vinton Cerf, co-creator of the Internet, peers into the Web's future. Nobel Prize winner Daniel Kahneman probes the nature of decision making. Lieutenant General Russel Honoré, the Hurricane Katrina hero, offers leadership lessons he applied in that crisis. Visionary executive Ray Anderson makes a powerful business case for environmental sustainability. And a host of other executives and thinkers tackle everything from easing the fear of layoffs to promoting wellbeing in the workplace to building customer engagement amid the post-crash "new normal." You'll hear from some of the best business and organizational minds in these pages. They steered leaders through the various crises of the past decade and helped find a way forward to what we all hope will be a brighter and more prosperous future. Decade of Change is more than a look backward - it is a roadmap for what lies ahead.